What is Cloaking in SEO & Should You Do Cloaking in 2019? Cloaking is a search engine optimization technique in which the content or information presented to the user is different from that presented to search engine crawlers (i.e. spiders or bots) for better indexing. In other words, cloak definition is, the web server is specially programmed to return different content to search engines than it returns to regular users, in an attempt to distort search engine rankings by making a cloak content. 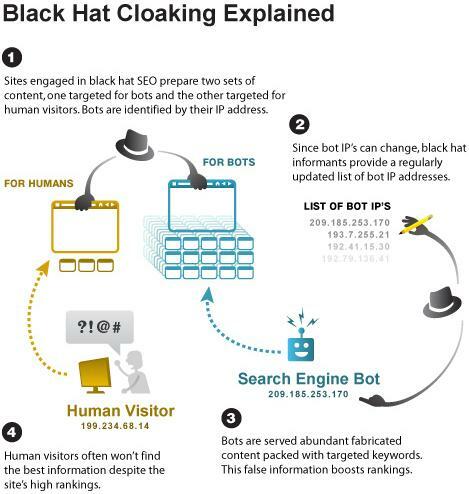 You might have understood now that cloaking is an illegal practice and is considered a Black hat SEO. The Search engine may permanently ban from our index any sites or site authors that engage in cloaking. Cloaking technology is considered as a violation of Google’s Webmaster Guidelines also as it provides our users with different results than they expected. Cloaking is implemented in order to improve search engine ranking by misleading the search engine robot into thinking the content on the page is different than it really is. It is often used as a spamdexing technique (search engine spam, search engine poisoning) to try to trick search engines into giving the relevant site a higher ranking. You also might have heard about page cloaking and web cloaking. Also Read: Link Juice – How It Impacts SEO? Now, the question is how is cloaking done? How is content displayed differently to users and search engines? You know in the internet world every internet device (i.e. computer, mobiles, tablet etc) are identified by IP address. Using cloaking, content is delivered based on the IP addresses or the User-Agent HTTP header of the user requesting the page. Cloaking is done by modifying a file called .htaccess. Apache server has a module called “mod_rewrite”. With the help of this module in the .htaccess file, you can apply a cloaking technique to your web pages. Webmasters gather search engines’ IP addresses or User-Agents (search engine crawlers). If mod_rewrite module detects that an IP address or user-agent belongs to a search engine, a server-side script delivers a different version of the web page (cloak URL). If IP address doesn’t belong to any crawler, it means it is a regular visitor and delivers a normal web page. He further said that if any site includes code that special cases for Googlebot by the user agent or IP address, Google considers that cloaking and may take action against the site. What are some common Cloaking Practices? Now, you are aware of the cloaking meaning. The next thing is, what type of content webmasters can show differently to users and search engine crawlers. You know that search engines index a web page and rank it higher in the SERPs according to META tags, titles, and other SEO techniques. So considering this thing in mind, webmasters optimize these basic things. Using this approach, webmasters add additional information like keywords stuffing, overwriting content in a way that is invisible or hidden to the users. To do this, webmaster adds this information in the same color that of background color which is not visible to human eyes. As you know flash is not recommended as per SEO guidelines. But there are lots of websites that are built in flash only or that requires a lot of flashes and they cannot avoid it. So rather than rebuilding websites and rewrite everything in plain HTML, they create content-rich web pages and provide them to search engine crawlers and flash pages to visitors. In e-mail distribution, cloaking is the act of masking the name and address of the sender so that the recipient does not know who sent the e-mail. A good SEO recommends having “TEXT to HTML ratio” as high as possible. In other words, your web page should have more text (content) as compared to your HTML tags. But if anyone is writing short articles or posts, your text to HTML ratio will be very low. To avoid redesigning the website, folks choose cloaking to meet SEO guidelines. Image gallery websites have more images than the actual content on their pages. And images are not scanned by crawlers. So, webmasters think that cloaking could help them get top placement for relevant keywords. What additional Practices are allowed that represent different content to users? Let us take an example of Google itself. When you open Google.com from outside the US, you will see a different page than someone else see in the US. It is redirecting users to a different page based on their geo-locations. For example, If a user opens google.com from his browser, it will redirect him to google.co.in. This is not considered as cloaking. It is done to provide a better experience to users so perfectly fine for any webmaster to do on their website. Users clicking from Google to a listed page can read the page without having to pay or register with the hosting site. You let Googlebot through as if it were a registered member and also allow anyone coming from Google’s search listings through. This practice includes the removing unnecessary parameters and other URL (URL cloaking). The key point here is you are not changing the underlying content. Note: If you are into affiliate marketing, it is highly recommended to cloak your affiliate URLs to make them a neat & clean. Now, you can see how cloaked URL looks and how clean & nice it is. To cloak the affiliate URLs, I am using Thirsty Affiliate WordPress Plugin, (I will soon write an article about this). You can also try LinkTrackr. Read more – LinkTrackr Review – How’s This Affiliate Link Cloaker Tool? **If you are not into affiliate marketing, I would recommend joining ShareASale Affiliate Program. If you still ask me whether you should do cloaking (that is not recommended) to fool crawlers and rank high, my answer will be NO. It’s a trick, and search engines don’t like to be tricked. Most search engines are against cloaking. Search engines algorithms are more intelligent than us. They often change their algorithms in order to discourage and stop cloaking and other techniques that create a negative user experience. They will find your site is using this technique sooner or later and your site will be banned and dropped from their index (In the worst case, it can be blacklisted also). In fact, Search giant Google has “blacklisted” German car manufacturer BMW for breaching its guidelines in Feb 2006. How long after fixing a Cloaking issues should I see improvement in ranking? Hey Mohit, is redirect urls count as cloacking? Excellent post, Mohit! Thank you for sharing this information. Very useful information, thanks for sharing detailed information about cloaking. Before there is no idea about the cloaking concept, but after read your article i come to know, what is cloaking?, why it’s useful?, how the content is delivered using cloaking?. Cloaking is a search engine optimization and black hat SEO technique, which is very interesting and useful concept to improve our search engine ranking by misleading the search engine robot into thinking the content on the page is different than it original. Using cloaking, the content is delivered based on the IP addresses or the User-Agent HTTP header of the user requesting the page. While Email sending , If you collect more information about cloaking i suggest you to refer this URL. Thank you for sharing this nice article. hi, Cloaking is well explained…..But would like to know , what are standards to design a url and landing page. Very detailed explanation on cloaking it is very helpful for me. thank you for such good explanation. You have done good information on this topic.Thanks for sharing it. Very well Explained post. Easy to understand and full of information. Thanks for sharing it and Keep doing good work. Ideas have been explained very well, but I think installing plugins like Yoast and Schema tags are going to be the best practices since they make the content more readable. Nice explanation for cloaking, Very informative post…Thanks a lot. I really see a lot of hidden text as for Cloaking SEO techniques. Nevertheless, thank you for tapping this idea once again, unfortunately only those who are risky ones would still treat this technique as white hat. Very well explained, one should only do cloaking if he or she wants to get hit hard by search engines. Thanks for sharing. Very nice explanation regarding cloaking…thanks for sharing. It is very nice seo techniques of presenting content of different sites.